"Nice to be in Hawke's Bay," Sting chirped. "What a fabulous place." Those 10 words alone, spoken after a quite stunning and orchestrally thunderous rendition of 'If I Ever Lose my Faith', pretty well doubled the number of words Eric Clapton spoke between songs when he held the Mission stage four years ago. Sting loves a chat. Loves to talk - and the great crowd across the grassed landscape lapped it up. Here is an entertainer, clearly still on top of his game, who introduced his songs in the way a composer should ... tells you the story of how they came about. And what great stories, like how the foxes ate his chickens ... how he was eerily followed in the darkness of New Orleans ... how he and a mate would intercept television signals from Russia and watch their kids' programmes. All incidents which led to a composition, and on Saturday night he rolled them out. Within the great crowd there were people dressed as bees (of course). But there were also some dressed as members of the police (apart from those actually on duty), with one female branch of the unofficial service being asked if they could show him their legs. "Call me shallow but I like that sort of thing," he laughed, adding he wouldn't mind if they arrested him later. Herein lay the anticipation for many whose enjoyment and musical perception of Sting is wrapped around his work with his former outfit, the three-piece band Police. An orchestra behind 'Every Little Thing She Does is Magic'? Strings and woodwinds behind 'King of Pain'? Well, let's just say the superb New Zealand Symphony Orchestra can cut some brilliant licks and thunder out some sharp riffs. Their combined and individual musical artistry is breathtaking and they pulled it off. 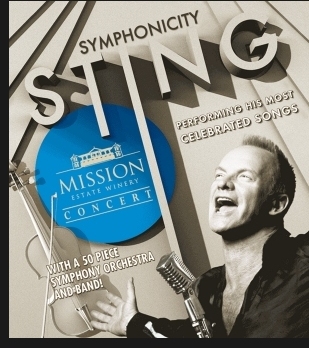 Sting paid tribute to the orchestra (and his own flawless musicians) no less than three times, and they earned every accolade, with the crowd roaring along in agreement. Simply, Symphonicity works like magic. The arrangements are as good as it gets and the fusion of the electric guitars and bass and drums just lifts the whole concept of music a step higher. The icing on the cake is the voice. There was not a flat note among the diverse spread of songs he delivered... and where does he get that breath from? He delivered a couple of holding notes for an astounding amount of time before immediately charging into a chorus. Complemented by the rich and remarkable voice of Australian vocalist Jo Laurie the sound coming from those microphones was stunning. He had the crowd in the palm of his hand. There was a mix of the familiar and not-so familiar, with the skill and sound ensuring even lesser known songs were greeted with waves of applause. 'Roxanne' began against a barrage of cheers, and it was a beautiful acoustic guitar and cello dominated rendition. As was 'Fields of Barley'. It was as clear and polished as if it were being delivered from a CD player (a very powerful one mind you). Casual in a black jacket and smart open shirt in the first set, then even more casual with a grey T-shirt in the second, he just got it on with everyone. The crowd chorused when required, and went slightly ballistic when he struck up the opening notes of 'Every Breath You Take'. When the drums and bass kicked in ... whoa! About 10.25pm he thanked everyone, took a bow and walked happily offstage, only to return four times for encores which culminated in what most had come to hear: 'Message in a Bottle'. The crowd found its voice again and were happy to swell the ranks of the backing singers to more than 20,000. He performed it acoustically, which was magnificent but, and this is my only niggle, I'd had loved to have heard it with the power of that magnificent orchestra behind him. This was a remarkable concert, and concert is the word. The organisers have set the bar at a stratospheric level now. I don't know how they can better that.